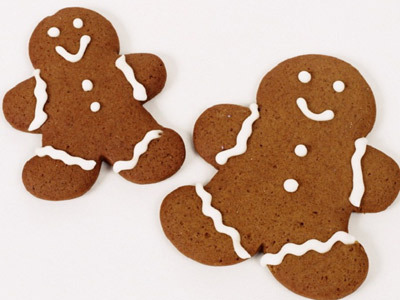 Christmas Gingerbread Cookies are very popular in many countries around Europe, including Italy (Via Frangiena) and France (Camino de Santiago). They are very easy to make and can be a special and original gift idea! Have a look at this amazing christmas recipe! In a large mixing bowl, sift the flour, add sugar, all the species and the baking soda. Add the butter in small cubes and the honey (or molasses). Mix at mid-speed until the dough looks homogeneous. Add the egg and mix again until you obtain a compact dough. After that, you can take the dough, divide it in some parts and extend it with the rolling pin, until you obtain a fillo dough of the height of 4mm (1,7in). Cut the dough in the shapes you like the most. 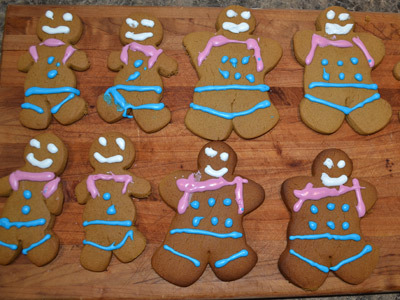 The gingerbread men are the classic ones. Put your shapes of dough on a baking tray covered by parchment paper. Preheat your oven at 180°C (356°F) and cook your cookies for around 10-12 minutes. When they gain a golden color and your kitchen starts to smell very nice, they are ready! In the meanwhile your can prepare the confectioner’s frosting. Whip the albumen and add inch by inch the confectioner’s sugar keeping mixing. Divide the frosting in as many bowl as the food colourings you want to use. Mix the colourings and once the cookies are cold, go wild with the colors! The frosting needs then to cool down for a while. 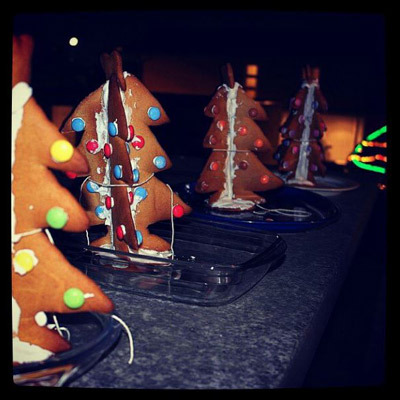 A special personal idea experimented last year: Gingerbread Christmas trees! You will need some Smarties or other kind of coloured small round sweets. You better need also another pair of hand to help you building your tree. 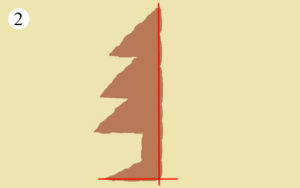 (1) Cut your dough in the shape of half fir with a sort of base in the end of the trunk. 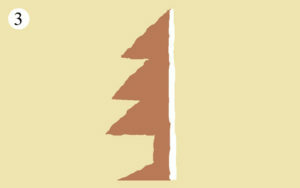 You need four of this shapes for every tree. 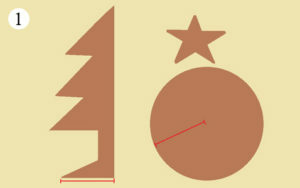 Cut as well a star for the top of your tree and a circular shape, large double the width of your half fir shape’s base. Cook your shapes and let them cool down. Once your shapes are cooked, let them cool down. You will notice that the border are not as straight as you cut them. (2) For this reason you need to cut the botton of the base and the trunk to straighten them. (3) Put a large amount of frosting on the trunk side of the shapes and with the help of a second person, put your four shapes together. Make sure that the bases are leveled. Glue the circular shape you cooked under the basis with more frosting. Take a twine and tie delicately your tree. Add the star and some fake snow, using another large amount of frosting. When your tree is pretty stable, you can add your decoration, using smarties glued with frosting, or any other coloured sweets that you like. Make sure the frosting is completely hard and dry when you get rid of the twine and move your tree. Put it on a colourful plate and wrap it with transparent wrapping. Here it is, a great, tasty, colourful, Christmassy gift idea!